All of this rainy weather has really been getting me down this week. I need some serious sunshine and if the weather won't cooperate I'll create my own with today's new brew, Map of the Sun from The Rare Barrel out in Berkeley, California. This beautiful beer is a blend of golden sour ales, aged in oak barrels with the addition of apricots. It pours a bright, white foamy head that dissipates almost immediately leaving behind almost zero bubbles. 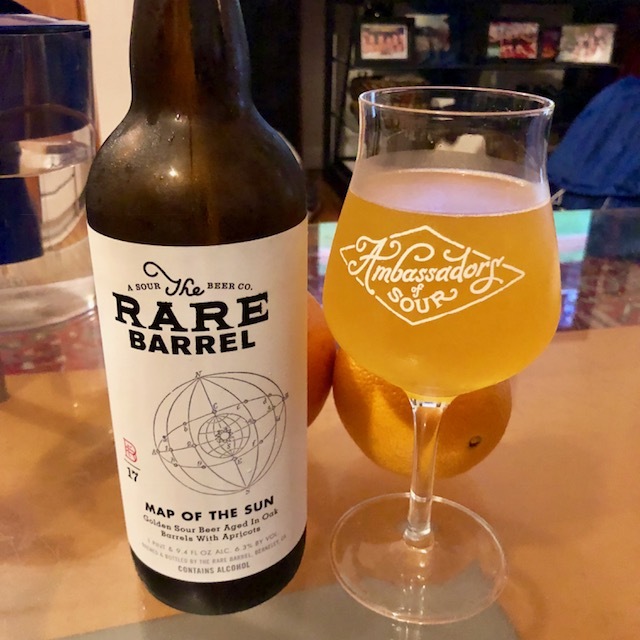 The smell is straight sour apricot with a sharp citrus and funk aroma while the flavor is a more balanced blend of sour and juicy, almost like biting into a ripe, fleshy apricot with just a hint of vanilla and oak on the finish. Every time I have this beer I'm blown away; definitely one of my all time favorites. Cheers to Friday!